Washington (CNN) – They came ready, aimed and fired – calmly. On Saturday, the first U.S. Senate debate between incumbent Democratic Sen. Mark Warner and Republican nominee Ed Gillespie was marked by zings - but also political politesse. During civil exchanges across 90-minutes stood two Virginians pushing different ideas but also outsize caricatures of the other. On one side: Gillespie's branding of Warner as a political lapdog for President Barack Obama who's responsible for job-killing policies and who promised to be independent – but is not. On the other side: Warner's attacks against Gillespie's resume that includes lobbying and stints in Republican Party partisan posts. The debate was held in neighboring West Virginia. Its opening shots were fired within the opening minutes. Gillespie decried a shrinking economy, job loss and business closings resulting from a growing government, "squeezing too many Virginians." "I appreciate Senator Warner's service to our Commonwealth," Gillespie said. "But unfortunately, his votes in the Senate have tightened that squeeze on hard-working Virginians and made it harder for the unemployed to find work." "In voting with President Obama 97-percent of the time, he's not been the senator he said he would be," Gillespie said. "Instead of being an independent voice for us, he's been a blank check for President Obama." Warner, running for a second term, highlighted Gillespie's former tenure as a lobbyist and in key Republican positions. Among Gillespie's previous jobs: former chairman of the Republican National Committee and a senior aide to President George W. Bush. "He's spent his entire career as a DC lobbyist and a partisan operative," Warner said. "He views every issue through the lens of Republicans versus Democrats. He even went on TV and called himself a 'partisan warrior.'" "I got to tell you, I work there," Warner added. "The last thing Washington needs is another partisan warrior." As with any political sport, each candidate's offense also required a good defense. On Gillespie's charge that Warner carries the president's water nearly all the time, Warner responded: "Let's set the record straight on this statistic that's used. Independent political observers have called it misleading and not representative of my record." "When I disagree with the president, I stand up," the senator told the audience. For his part, Gillespie picked apart the hyper-partisan lobbyist caricature by employing a common tactic: turning perceived weaknesses into strengths. Citing his "experiences of having worked on Capitol Hill, having been a party chairman, having advised private sector people how to get things done with private, with bipartisan support in Washington," Gillespie said, "I think it would allow me to stand up to the special interest groups, to standup to Senate leaders, to stand up to a White House for Virginians and keep my promises to the people of Virginia. "I believe my experiences would make me effective on Day 1." The candidates also debated several issues. On job creation, Gillespie highlighted his five-point agenda to, among other things, create jobs, raise take-home pay, and hold down health-care costs. "If you're for economic growth, you're for me," the Republican candidate said. Warner pushed a bipartisan approach to lowering the national debt and taking on tax and entitlement reform. "What I didn't hear from my opponent was any acknowledgment that he was a cheerleader for the Bush-Cheney economic policies," the senator said. And the two men sparred over the nation's health care law. "We've seen the stagnant wages and the lost jobs as a result, for example, the Congressional Budget Office says that Obamacare – which Sen. Warner worked to pass – will mean," Gillespie said. He advocated replacing the law "with market-oriented reforms." Warner criticized the law's rollout, but said it could be tweaked. "What I hear from Virginians is they're tired of this issue being used as a political football. And they actually want to see it fixed," Warner said. "They don't want to go back to the days where people with pre-existing conditions couldn't get health care, or women were charged differently than men." "Now the Obamacare rollout was a disaster. But what I've laid out are actual specific plans on how we can improve it. The candidates did find agreement on some subjects. On dealing with Vladimir Putin, debate moderator and PBS anchor Judy Woodruff asked: what should be done to address actions by the Russian President regarding Ukraine and has Obama has been too timid? "I think the president should have acted sooner and tougher on sanctions on Russia," Warner said. "I agree, he should have acted sooner," Gillespie said. "I agree we should stiffen the sanctions." Regarding the undocumented children from Central American countries who've surged into the United States via the southern border, should they be returned? Some of them, Woodruff noted, are being kept at a facility in Virginia not far from the debate site. "I think they are due some level of process," Warner said. "And that process will result, probably, in some of those kids going back." Gillespie responded: "The most compassionate thing that we can do, is to once they've been afforded the process and we've expedited the process, is for them to return to their parents." And regarding Iran, if a nuclear deal can't be reached – would the men support U.S. military action against the country? "I believe that it's important that the United States never take that option off of the table," Gillespie said. "On this issue, I think my opponent and I generally agree," Warner said. "I think no options should be taken off the table." 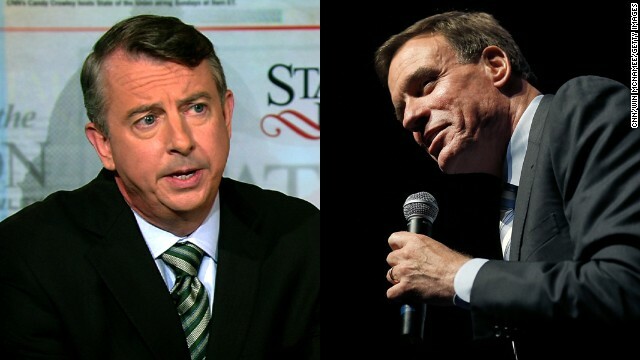 Gillespie faces an uphill battle to unseat the incumbent Warner. A recent Roanoke College poll shows the senator holding a 25-point lead. The two sides need to come together more. There must be balance to everything in life or it will all end up f'ed up in the end. Yes, in the short term, leaning too much in either direction may seem good initially but it won't be for long. Lean too democrat for too long and the US becomes a socialist state. Lean too far GOP and the US becomes an Oligarchy. This is why then idea of give and take, and compromise should be championed by both sides more. Instead of lowering the Corporate tax rate from 40 to 35, why not 37.5? I know if things were only that simple, but you have some pretty smart people in Washington. There is no reason they can't get it done. Lesson folks i don't care what the repub candidate says, his mission like every other repub mission, is to destroy this president legacy, by destroying the country and blame him. They've destroyed our triple credit rating, threatened to close down the government on nunerous occasion, actually did it after he was reelected, and virtually say no to every thing this president wanted, and it didnt matter if they were pushing what he requested yesterday. Just to say he was a one term president. Imagine what they will take this country through to destroy his legacy. Furthermore the 2016 president elections is just around the corner. Do you really think these rabid repubs going to do-anything to help this country, to show how good this president and the dem party is especially with Clinton set to take over the presidency in 2016. They would rather hold this country back and allow China to be the soul super power while nation infrastructure wither backward into the 20th century. "...President Barack Obama who's responsible for job-killing policies..."
It's actually kinda simple: You can have jobs or you can have "free" healthcare, but you can't have both. The money for the "free" healthcare has to come from somewhere and once it's allocated to healthcare, that doean't leave anything for hiting. Democrats need to learn this. Given that he has shown so much partisanship, I don't think that Gillespie is really the person that VA should have in the Senate. The best thing the Demicrats can do is spend all of their money oon get out the votes effort. They have the moral high ground but without presidential year numbers it is all for not. VOTE AMERICANS! A cheerleader for the Bush-Cheney economic policies , deficits don't mater , the economy is strong , we will be greeted as liberators , mission accomplished ? Gillespie's resume includes lobbying on K street for big government spending and no bid contracts . Do we need another lobbyist with no moral compass ? I don't know but the Barbie scandal baffles me... Is Barbie not going support girl scouts or something... And that leaves me offended...I'm offended when somebody walks around without their shoes tied...I'm offended when a debates serieves popular sovernty... I'm sorry I'm offended when a donut costs 2$ but Barbie being strung out of girl scouts Mann??!! This senate seat is not a debate The DEM will win big time RNC Koch bros spend your money and hearts out.. and lose any way. ax you will in many other states you think you can turnover at the senate level. ...."I got to tell you, I work there," Warner added. "The last thing Washington needs is another partisan warrior."... Is this statement his resignation? Sounds like it to me...don't let the door hit you in the behind on thee way out! VA, just vote straight to democratic ticket, enough war lies of republican trash, in fact they broke USA out of two wars, trickle the chuckle. EVERY Democrat Senator has been nothing but a lapdog for this failed President. This is why they all have to be tossed out if this country is to ever get back on track and growing economically like we need to grow, not this pathetic 1-2% which does nothing but keep people unemployed and people in low paying jobs. We are going to get there with government road paving and bridge building projects which is all these Democrat clowns keep proposing. Warner only has a 25 point lead against a Bush advisor and lobbyist? This proves republicans are brain dead. Neither of these guys have much to offer in the way of ideas for the bold, drastic reform that is necessary to save this country from the current critical mass....you cannot have an honest discussion about the economy without examining our usurious banking and monetary-systems, the fulcrum on which all other systems turn. @Tampa, you continue to be so predictable in your postings. Perhaps you could learn some new material,, or are you brain dead? Yo Landa – Truth always hurts republicans. Henry Miller – no one is getting free health care. Hannity is lying, and the brain dead eat it up. Lol @ Tampa Tim, i dont care what anyone else says...i love reading your posts! So....keep on, keepin on! And @ haha678, yours was freaking hillarious! Really can't wait to Ed Gillespie,Thad Cochran,Thom Tillis,Kevin McCarthy,Sheldon Adelson,Karl Rove,Rupert Mourdoch,Lindsey Graham,John McCain,Susan Collins,Hayley Barbour,Grover Norquist and the GOP stuff Jeb Bush down the tea potty's throats EXACTLY like they stuffed Romney down. Straight no chaser. Hillary will drink to that! Many millions of people on Medicaid because of Obamacare. Medicaid is free (just not to the taxpayers footing the bill). Many millions more getting heavy subsidies of their healthcare premiums with Obamacare. Not totally free but again the taxpayers foot the bill. Got any more lies that need straightening out?